The New Horse Shox® Rubber Jacketed Horseshoe is high technology allied with scientific knowledge of Equine Veterinarians, creating a new concept in Rubber Jacketed Horseshoe . Horse Shox Rubber Jacketed Horseshoe were developed to provide a better confort and safety for your animal. New Concepts in Rubber Jacketed Horseshoe . Based on technical standards and using high-quality rubber products, Horse Shox® will provide what your horse need. 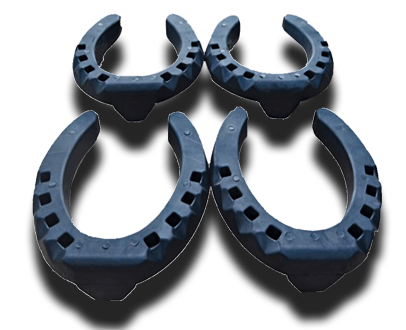 Horse Shox® have inside a conventional horseshoe that improves the structure, maves the horseshoeing easier and enhance the comfort for the horse and the safety for the rider. Horse Shox® can be also used as an auxiliary treatment on some kinds of hoof injuries, overcoming the expectation of recovery of the animals. We are manufacturers, you can buy with us. We will provide you benefits, discounts and free access to our specialists veterinarians team! * Optimizes the performance of athlete horses * Reduces biomechanical stress caused by hoof impact *Increases blood flow inside the hoof * And Much More! NEW BOR, a company born in 1992, using its know-how and technology in rubber parts, made a joint-venture with Veterinarians specialized in Equines, Farriers and horse trainers, and developed Horse Shox®, a new concept in Rubber Jacketed Horseshoe . Based on technical standards and using high-quality rubber products, Horse Shox® will provide what your horse need. By being made of RUBBER, Horse Shox® provides a better grip at most soils, offering safety to rider and horse at a simple ride, at work or even a show. Horse Shox® can be also used as an auxiliary treatment on some kinds of hoof injuries, overcoming the expectation of recovery of the animals. · Excelent fixation of nails. High technology allied with scientific knowledge of Equine Veterinarians creating a new concept in Rubber Jacketed Horseshoe . Horse Shox® Rubber Jacketed Horseshoe were developed to provide a better confort and safety for your animal. NEW BOR, a company born in 1992, using its know-how and technology in rubber parts, made a joint-venture with Veterinarians specialized in Equines, Farriers and horse trainers, and developed Horse Shox®, a new concept in Rubber Jacketed Horseshoe . Based on technical standards and using high-quality rubber products, Horse Shox will provide what your horse need. Where I can buy Horse Shox® ? If you still have more doubts send us an e-mail and our technical team will return ASAP.